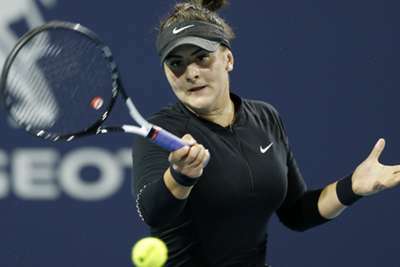 Bianca Andreescu continued her winning run, beating Angelique Kerber in the Miami Open third round. Andreescu, 18, extended her streak of victories to 10 after getting past Kerber 6-4 4-6 6-1 at the WTA Premier event. The Canadian teenager has starred so far this year and proved too good for Kerber in a repeat of the Indian Wells Open final, also won by Andreescu. Andreescu used her power early as both players showed signs of injury and fatigue. Kerber's left thigh was strapped, while Andreescu needed treatment on her shoulder during the first set. After 12 minutes, Kerber took a 2-0 lead, but a double fault handed the break back to Andreescu, who made the most of the opportunity. Andreescu created two set points in the 10th game, only needing one when Kerber sent a wild forehand long with her 14th unforced error of the set. Kerber became more aggressive early in the second set and then incredibly won five straight games from 4-1 down to level the match. Andreescu opened up another 4-1 lead in the third set as the players continue to battle after 01:00 local time (05:00 GMT). This time, Andreescu made no mistake, closing out a huge win to continue her scintillating run of form, with Kerber seemingly unhappy with her opponent as they shook hands at the net.